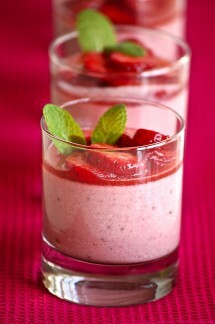 Here you have a sweet dessert for you, Mr. President! I do hope you are a fair, wise and comprehensive President. Good luck and Congratulations!!! Have it after eight or after nine or just when your busy agenda allows you to have it ☺. Ingredients for 4 servings: 4 hard pears (I used conference ones), 1 liter of water, 150 grs of sugar, 1 little cup of Peppermint, fresh mint leaves. 100 grs of black chocolate and some water. Peel the pears and place in a small pot so that the water can cover them. Add the sugar and the peppermint. Bring to a boil and simmer until they become tender. Reserve and let cool down. Once cold, place in the fridge with the green water. Before you present the dessert, strain the pears (I forgot to do that and that’s why the chocolate seems more liquid in some spots). While you have them in the strainer, prepare the chocolate: Chop the chocolate and place in a small bowl. Boil some water and pour a bit in the bowl until you get the texture you want… that easy! What a creative tribute Nuria! Que amazing! 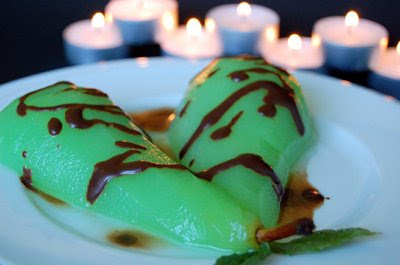 I also love how green the pears look…a beautiful dessert for a beautiful day in the world! Thank you for your Catalan treat for our new President. What does a “little cup of peppermint” mean — is it extract (concentrated flavor)? I’m intrigued with the possibilities of that and other flavorings. Oh, Nuria, you made me burst into tears. I’m sitting here just crying. What a thoughtful, lovely tribute. BTW… this is what my parents sung to me when I was little. They were civil rights activists and this was a major song of the movement, which you probably already know. Maybe there is some hope for the U.S. – and always when we have international friends like you. Hola Michelle, thanks! I think he will be a great President! I have to come back and comment again because when I first looked at this post, I focused on the food. We are food bloggers, after all, right? But a second look showed me the broader, and more important picture, the thought that went into this post. The song, the video, and the sentiment are super. I’m not only inspired by Pres-Elect Obama, I am inspired by observers like you who see the broad picture and express it so well. this is such a beautiful dish! 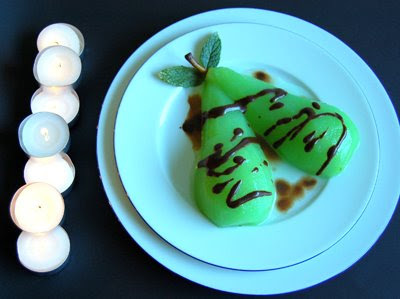 it looks like mint chocolate chip pears! i love it. they are so bright green- i wonder if that would work for other pale fruits, too. very cool. Hola Joanna! Go try!!! And tell me if it worked ;D Thanks for your kind words! Aaaaah… so it was finnish, ok, I will use the translator and take a look… don’t know why I thought it was hebrean. Thanks so much! I love it Nuria. Beautiful. The new president needs all the good vibes and suppport he can get. Its a long road ahead. 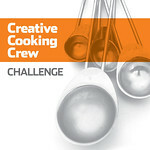 I want to make it! NOW LOL. I love things in syrup. Hmmm what exactly is the peppermint??? Is it “Peppermint Extract” what is it called if I go to the store? Obama’s going to have a difficult term in office but he has many people around the work to back him. Hola Nathan! 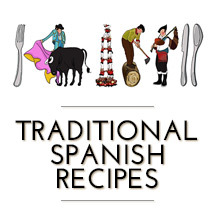 Sorry it took me some time to answer… I’m cooking a bullabesa (many hours in the kitchen). I bought a bottle that says Peppermint Cream, it has 27% alcohol volume… I think you should be able to find it there :D. The bottle is 3/4 of a liter. It’s such an easy and impressive recipe ;D. Please let me know if you do it. 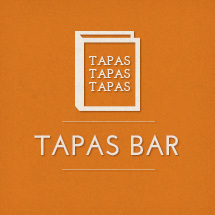 Nuria, I watched the slide show but didn’t have the volume on…ooops! So, not only can you cook but you can sing…Nuria does Motown. You have a very soulful voice…you rock! This is taking food to a new level…I bet this was great! Hola Emiline! They are so easy to do :D! How was the concert? thanks for your appreciation of our new president! i still get a bit misty-eyed and the chills when i say “president obama”. Its looks so perfect to me…. Rosquillas: A grandmother’s sweet old recipe.